KENKI DRYER which can dry materials that no other company can do, such as sticky, adhesive, and viscous materials, and also raw material slurry in liquid state, has two technologies patented in both domestic and overseas. One of the technologies is a self-cleaning mechanism called Steam Heated Twin Screw technology (SHTS technology), and the other one is a set of four drying mechanisms which are crashing drying, agitation drying, circulation drying and indirect drying. KENKI DRYER is designed and built based on these two technologies which is patented in domestic and overseas. Since it has both outstanding ability and simple structure at the same time, initial, running and maintenance cost is low. Please do compare with other companies’ products. Because of its simple structure, it hardly breaks, it has small number of replacement parts, it is easy to be maintained, and it has long service life. Although only saturated steam is used as heat source, our dryer uses both conductive heat transfer and hot blast, so that it is outstanding in safety and hygiene point of view and the quality of the materials after drying is uniform and stable. For sludge drying, estimated time taken to retrieve dryer’s cost by reducing industrial waste disposal cost is about 2 – 3 years. For raw material slurry drying, we recommend replacing traditional box shaped compartment tray dryer which needs laborious works of manual operation. Why don’t you consider recycling wastes when they contain high moisture contents, e.g. used tea leaves, soy pulps, food residues and livestock excretions, etc. Patented in Japan, U.S.A and Taiwan. Applied for patent in France, China, Korea, EU and Canada. One of the International Patented Technology that KENKI DRYER has is a self-cleaning structure called Steam Heated Twin Screw technology (SHTS technology). No matter how materials are sticky, adhesive and viscous is, they can be dried without clogging inside of the dryer because of this unique structure that no other products has. For example, even materials stuck to the blades of one screw, blades of the other screw in the dryer’s body forcibly peels the materials off as they rotate. Since the blades rotate by peeling the material off each other, any sticky, adhesive and viscous material does not adhere to the blade, and the blades continue rotating, peeling, agitating and heating material without stopping while they carries material further. Even raw material slurry which is strongly sticky and adhesive is fed with liquid state, the slurry can be dried surely without any trouble by using this technology. This SHTS technology took about 7 years to be completed and it is patented or applied for patents not only in domestics but also in abroad. Also, in case of drying of organic sludge after dehydration process of water treatment, sludge often forms large lumps because they are affected by flocculant, and it often happens that only surface is dried but inside are not when sludge is discharged as large lumps. However, using by this technology, the materials being dried are forcibly sheared and torn off when they touch the pair of blades, or a blade and trough/cases. As the drying process is proceeded, the materials being dried becomes smaller and smaller since they are forcibly peeled off when they stuck to the blade, and also repeatedly shared, torn off and agitated during being carried and heated. As the size of the material being dried gets smaller, heat can be conducted and reached to inside the material thoroughly and quality of the material after drying becomes stable. Because of the low-temperature drying using saturated steam, there is no possibility that materials after drying are discharged with unstable quality caused by being carbonized, scorched or unevenly heated. Even materials stuck on the blades of one screw, blades of the other screw peel the materials off as they rotate. No sticky or adhesive materials can stick on the blades. Hence, any kind of material can be dried without being clogged inside the dryer. Unique shaped screw blades agitate the material enough, and the material can be dried completely by being heated from deep inside. There is no carbonization of the material on surface of screw blades and screw shafts because of low-temperature drying. 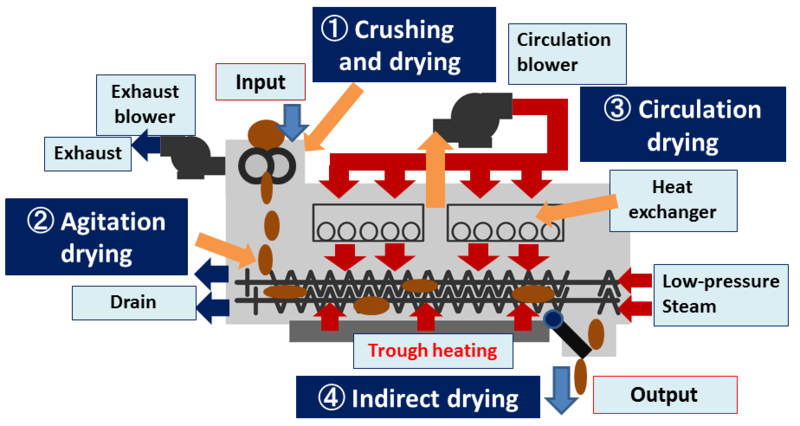 One of the characteristics of Steam Heated Twin Screw Technology is its self-cleaning mechanism, and it also includes mechanism of shearing and tearing off the materials to be dried. Sludges after dehydration process of water treatment often forms large lumps because of effect of flocculant, and drying process becomes difficult since heat hardly reaches to inside as the sludge forms larger lumps. By the unique structure of rotating blades that SHTS technology has, material to be dried is sheared and torn off when pair of blade intersect each other and blades touch trough and case. The material is also agitated when the blades rotate. The materials stuck to the blade are forcibly peeled off and also series of movement which are shearing, tearing off and agitating are repeated while material is being heated and dried. Therefore, the materials being dried does not shape large lumps since they are not affected by flocculant, and their size become smaller as they move forwards in the dryer. As the material become smaller, heat can reach inside of them thoroughly and quality of material after drying become more stable. Unstable output whose surface is dried but inside is not dried often seen after drying of organic sludge etc., however, KENKI DRYER never discharges the material with such unstable quality. The following is picture of organic waste in a food plant after being dried. By comparing the size of the material after drying, smaller grains contain low moisture contents. The unique and original drying mechanism of KENKI DRYER is also International Patented Technology. Because 4 drying mechanisms which are crashing drying, agitation drying, circulation drying and indirect drying work simultaneously and add heat to material being dried repeatedly and continuously, inner part of the material is dried thoroughly and quality of discharged material after drying is stable. This series of drying mechanisms prevents agglomeration which causes insufficient drying from feeding process of the material into the dryer until discharging process after drying completed. Various ingenuities to conduct heat surely into inner part of the materials are exercised and stable heating and drying are proceeded continuously. Even drying method is conductive heat transfer which uses saturated steam as its heat source, the temperature inside the dryer is not affected by outside air temperature and always kept high and steady because of unique drying mechanism which shut outside air out as much as possible. The unique drying mechanism which shut outside air out draws air inside the dryer in with blower and fan, heats the air with heat exchangers mounted on upper part in the dryer, and blows the heated blast onto the material to be dried which is being conveyed as the dryer is shearing and agitating repeatedly. Although hot blast is generated intentionally and blew on the material to be dried, outside air drew in is not used for that purpose but highly-heated air inside of dryer is heated once again and blew on the material. Wet clothes are dried well within blowing wind and the same mechanism is applied to this hot air drying method, so that hot air is blew onto the material to be dried. It can be said that KENKI DRYER is a dryer with an epochal and unique drying mechanism which use both conductive heat transfer and hot blast even only saturated steam is used as its heat source. Because of low-temperature drying using saturated steam, the components of the material to be dried are not changed and outstanding in safety and hygiene point of view. Also, the quality of the materials after drying is uniform and stable because of its unique drying mechanism based on International Patented Technology. A material supplying device which has uniquely shaped blades being attached to two shafts and rotating constantly. It smashes solid and sticky materials such as sludge, and carries smoothly to the main body of the dryer. Steam are supplied into the two shafts so that the shafts and the blades are continuously heated. 2 shafts with patented blades attached inside the dryer rotate and move materials to be dried forward as they peeling, shearing, and agitating the material repeatedly. Steam is inserted into the shafts and blades and the materials are always heated and dried by them. Resident time within the dryer is controlled by changing the rotation speed, so that moisture contents can be controlled as well. Air inside the dryer is drew in with circulation blower and returned to the inside after being heated as passing through steam heat exchanger mounted on upper part. Hitting the heated air incessantly at the top part of the material accelerates the drying progress. By applying the mechanism that wet clothes are dried well within blowing wind, hot air is generated intentionally and blew onto the materials which is moving forward as being peeled off, sheared, and agitated repeatedly. No outside air got in. A heat exchanger is attached to outside of the dryer’s trough. Steam is supplied to the heat exchanger and the side and bottom parts of the dryer are heated up continuously. KENKI DRYER shuts outside air out, and continuously operates circulation heating which heats air inside the dryer and blows it on the material. Therefore, temperature inside the dryer is not affected by outside air and always kept high, and drying process is accelerated by blowing hot air on the materials to be dried. Even only saturated steam is used as its heat source, circulation drying introduces hot air drying at the same time and it can be said that KENKI DRYER is a dryer with epochal and unique drying mechanism which use both conductive heat transfer and hot blast.